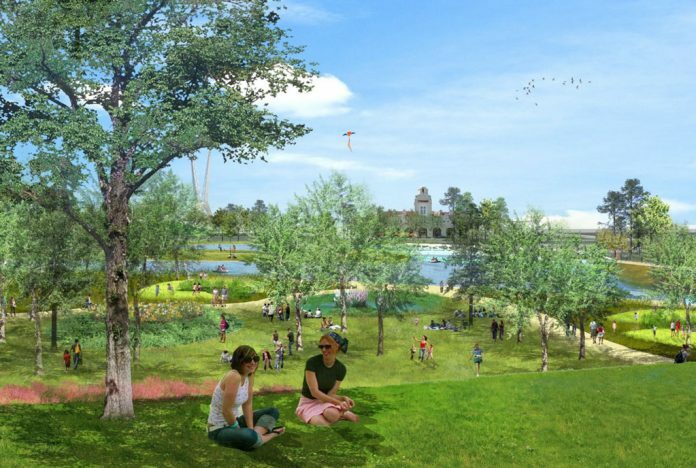 Scissortail Park will extend downtown’s reach with nature trails, athletic fields, concert venues and thousands of trees. When the north section of Scissortail Park opens next year in Oklahoma City, visitors will have a multi-use venue that has the makings of an aborist’s dream. AN ARTIST’S RENDITION SHOWS THE AMBIENCE OF SCISSORTAIL PARK. 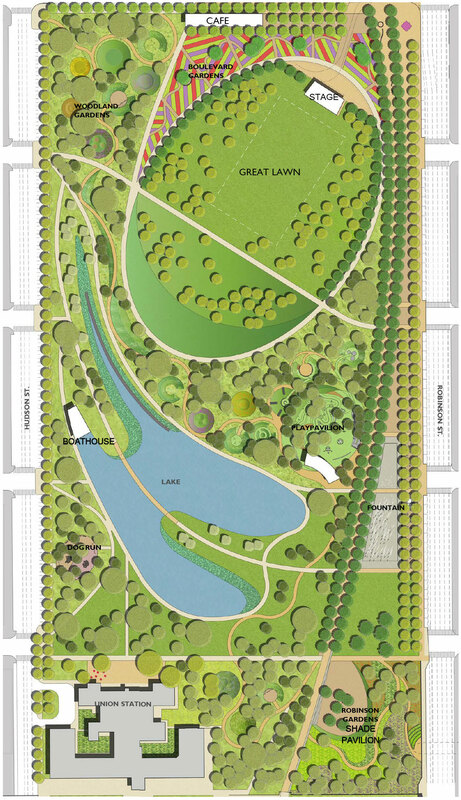 The nearly $150 million Scissortail Park, under construction since June 2017, will have nature trails, areas for concerts and special events, sports fields, a cafe, a roller-skating rink and a three-acre lake with paddleboat rentals. Also planned are a dog park, woodland and flower gardens, playgrounds “and a huge interactive fountain,” says David Todd, program director for the Metropolitan Area Projects Plan, known as MAPS 3. Todd says the park will be an important green space for the growing numbers of downtown residents, but also a civic gathering place. “The great lawn can hold up to 15,000 people for concerts,” he says. The park – near Chesapeake Energy Arena, a streetcar stop, and the convention center and Omni Hotel, under construction – will attract visitors as well as locals. “That’s going to add a lot of synergy back and forth,” says Heffernan, adding that groups might consider booking events at the convention center because of Scissortail’s location. She says the nearby Myriad Botanical Gardens will complement, not compete with, the park. The core mission of Myriad is to showcase collections of plants, Heffernan says. It also features the Crystal Bridge Tropical Conservatory. The Myriad holds about 4,000 people on its large lawn, where people gather for summer movie nights, twilight concerts and other programming. Seasonal offerings include Pumpkinville and an ice-skating rink. Everything at Scissortail Park will be free, except for paddleboat rentals, roller skating and private events, such as weddings. Myriad Gardens charges for some programming, such as horticulture classes, but offers discounts to members, which Heffernan says might lead to a joint membership program for the two parks. Heffernan says the north section of the park should be ready in June, with tentative plans for a three-day grand opening featuring a festival and concerts over Labor Day weekend. The 40-acre north section will extend south from the new Oklahoma City Boulevard to Interstate 40, between Hudson and Robinson avenues. The 30-acre south section, scheduled to open in 2021, will extend from I-40 south to Southwest 10th Street between Walker and Robinson avenues and to Southwest 15th Street between Harvey and Robinson. Part of the southern section will be on the north bank of the Oklahoma River. “It will be more of a landscaped area, with soccer [fields] and basketball and tennis courts,” Heffernan says. The Skydance Bridge, symbolizing the scissor-tailed flycatcher (the state bird), spans I-40 and will connect the north and south sections of the park. The Social Order Dining Collective will manage the cafe, says Jim Vidmar, vice president of marketing and communications for the Myriad Gardens and Scissortail Park. The group has introduced OKC restaurants such as the Jones Assembly, Fuzzy’s Taco Shop, Texadelphia and Seven47. Heffernan says the nonprofit foundations that operate the parks under a lease agreement with Oklahoma City have raised money through grants, corporate donations and income from rentals and tickets to events. 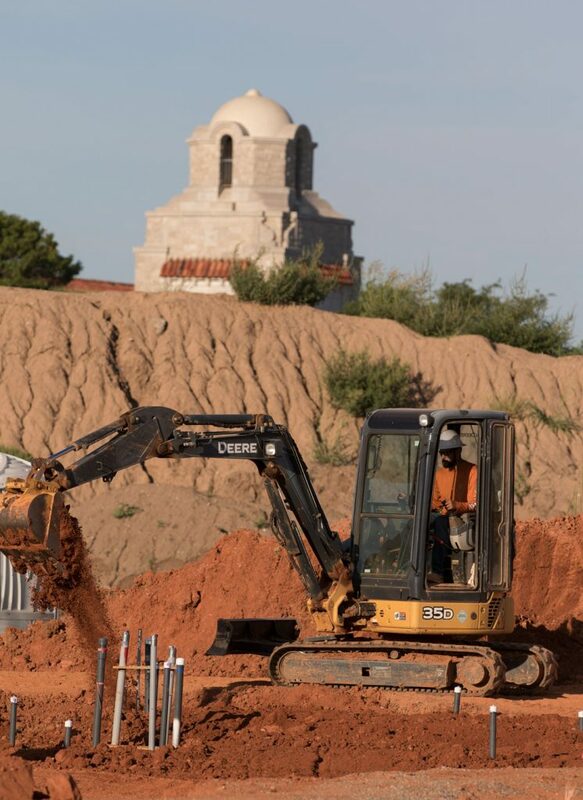 Scissortail Park already has a Facebook page, which features construction photos and showcases the park’s logo, a colorful image of a scissor-tailed flycatcher. Heffernan says a webpage should launch this month. MAPS 3 is a capital improvements program in Oklahoma City that uses a one-cent sales tax to pay for debt-free projects that improve quality of life. 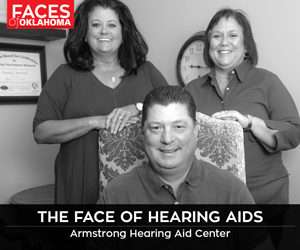 It was approved by Oklahoma City voters in April 2010 and ended Dec. 31 after raising more than $777 million. MAPS 3 construction projects are scheduled to continue through 2021.